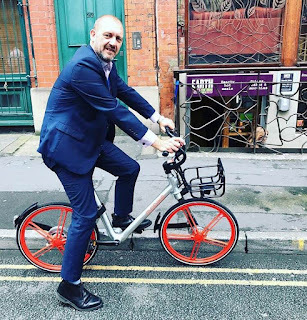 The Marple Leaf: Mobike - play nicely please, or is it all over already? Mobike - play nicely please, or is it all over already? These sharing Mobikes are great. The first day I took them it was ideal - it was sunny, I was bouncing between work and the Digital Summit at the Museum of Science and Industry and it all felt very modern and exciting. And it worked. I felt really proud that our city had taken 1000 of them and they were popular. I last took one last Friday to go and meet my mate Steve Connor for a vegan lunch, which passes all Catholic tests too. But it was after four attempts. And in all seriousness I haven't seen a single one this week. Have they dispersed? Or are there more broken than they're letting on? Rightly, the MEN are asking this week if this spate of vandalism means we're just not ready for them. Cycling advocate Helen Pidd in the Guardian was an early fan, but is wondering whether the vandals stealing the handles have potentially wrecked it for everyone and whether this is another example of crappy self-entitled sod-you attitude: "I do not want to live in a country where you can be caned for graffiti, but I would like to live in a city where people know how to share. The man who wanted to have his own personal Mobike displayed an all-too common sense of entitlement. There is always someone who refuses to put headphones on or take their feet off the seat, who won’t shut up during the gig and can’t be bothered finding a bin." So, come on Manchester, play nicely. This could be great.